Urban nature doesn&apos;t get any more wild, and yet as easily accessible as Stringers Ridge. 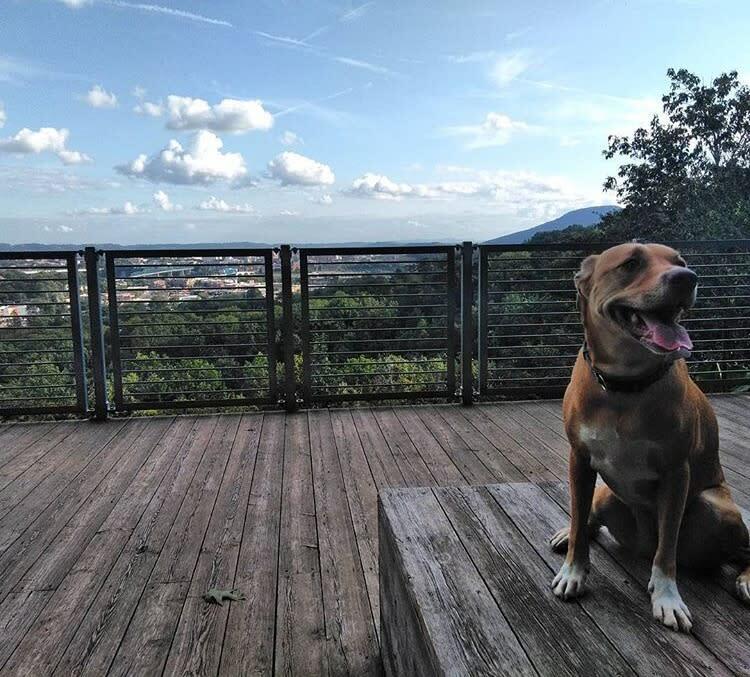 This 92 acre park, located a whopping 2-miles from downtown Chattanooga, is home to a charming trail system that is loved (or at least appreciated) by everyone who makes a visit—whether it be adrenaline junkies with their single-speed mountain bikes, excitable first-timers lacing up a brand new pair of trail running shoes, or even parents exposing their young ones to the joys of hiking. Whatever activity you choose to tackle at Stringers Ridge, you&apos;re sure to have an enjoyable experience. Here&apos;s a guide to the best riding, running, and hiking that this fantastic urban trail system has to offer. Riding the network of trails at Stringers is kind of like riding the graph of a sine function. ( For those of you who may not remember your high school calculus class, picture a wavy line that goes straight up and down... forever.) While that may sound a bit daunting, the ups and downs at Stringers are generally short-lived and mostly manageable—even for all you single-speed masochists, er, enthusiasts out there. 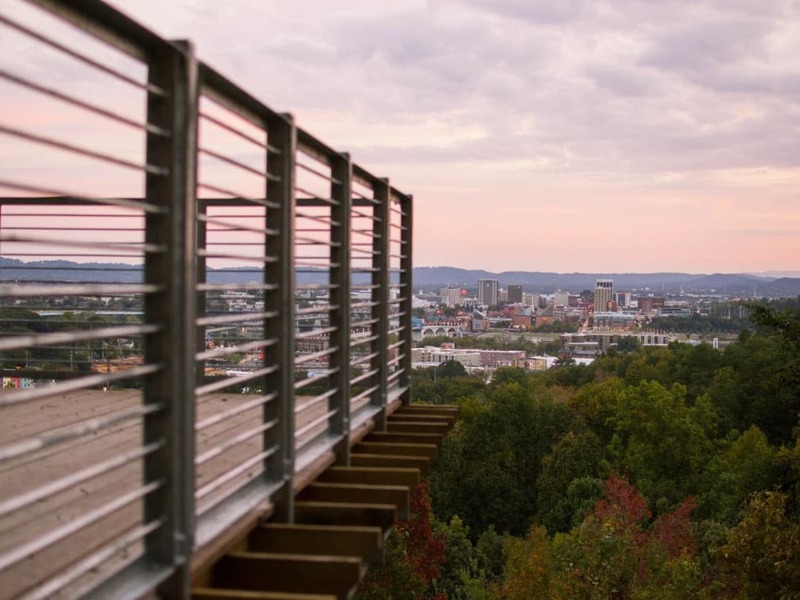 The fact of the matter is: the mountain biking community of Chattanooga is incredibly fortunate to have singletrack access so close to downtown. There aren&apos;t many other places in the country where you can hop on the saddle and reach a trailhead without even getting in the car. And while Stringers might not offer the same amount of distance or “big mountain” feel possessed by some of the other trail systems in town, having it so close to the city makes it the perfect alternative to a lunch break spent binge watching Netflix or a post-work evening spent drinking a few too many happy hour cocktails. But convenience isn&apos;t the only thing that makes Stringers, for lack of a more elegant phrase, an absolute blast! The comparison of these trails to a sine function line that forever goes up and down means that the climbs are frequent, steep, and difficult for some cyclists (especially if you’ve decided it was a good idea to take the gears off your bike), but again, also fairly short. The same is true for the descents, which are fun, flowy, and, well, really fast. Nothing at Stringers is particularly technical or frightening, so the confident cyclist can get moving rather quickly and the novice can get acclimated just as fast. Do be aware, though, that most of the climbs and descents are accompanied by tight switchbacks that could send a cyclist straight off the trail and into the woods if said cyclist isn’t ready for the abrupt change in direction. What makes Stringer’s unique, however, is that it can be as challenging, or as easy as the rider wishes. An elite cyclist and the ambitious eight-year-old fresh off the training wheels can both have equal amounts of fun on these trails. The smooth, flowy singletrack on the aptly named "Hill City Trail," for instance, makes it optimal for a wide variety of skill levels, and all of the features that might excite a more advanced rider—the steep climbs and descents, rolling dirt jumps, and tight berms—can be ridden at lower speeds with ease. And should a less experienced cyclist continue to ride at Stingers, improved bike handling skills are essentially inevitable. Another thing to be aware of when riding at Stringers is that the trails are directional. This means that on Sundays, Tuesdays, and Thursdays, cyclists travel in one direction while hikers and runners do the opposite, and it switches on the other days of the week. This feature helps prevent head on collisions. All of the trailheads are clearly marked by a sign dictating the direction of the day for both cyclists and runners. The running scene at Stringers is fairly similar to the mountain biking in that the constant ups and downs can make for a rather challenging run on one hand and an equally exhilarating one on the other. Another thing that transfers perfectly between riding and running at Stringers is obviously the convenience factor. For an easy run with a gradual ascent, start at the Cherokee Boulevard side of the park and head up the remains of the old asphalt road. 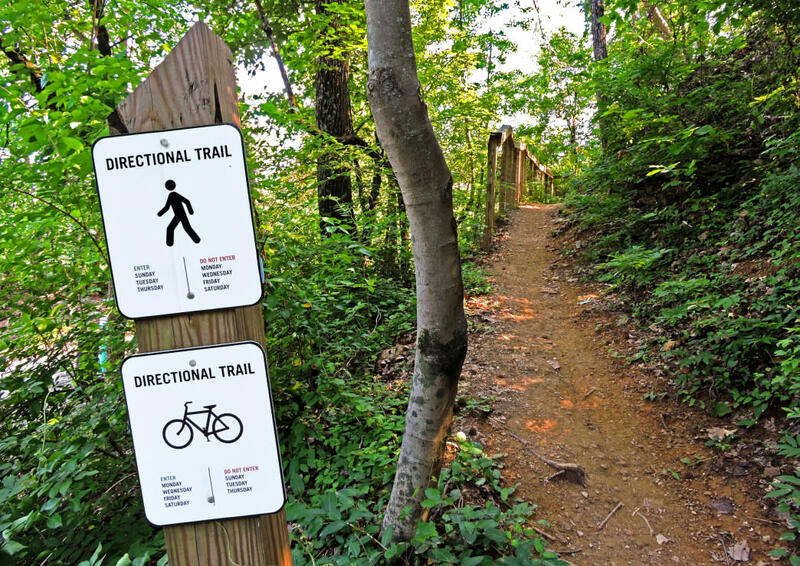 To keep things relaxed, you can stick to the double-track past the overlook of the city for nearly a mile, and then loop around on an easy singletrack known as the "Strut." More advanced runners will want to jump on the four mile "Blue Loop" that twists, climbs, and descends around the perimeter of the park. You&apos;ll find that "Hill City" packs a punch and "Double J" on the other side also has its own vertical charms—moderate but still notable. Coming in from Spears Avenue involves a more spirited climb on the singletrack up from the parking lot. Again, you&apos;ll have options to take the more challenging "Blue Loop" or cut over on the Strut to coast along on a shorter run. However you approach, you can traverse almost five miles of singletrack that is typically groomed to smooth perfection. One benefit for trail runners at Stringers is that they have access to a few more trails than cyclists do. While none of the individual trails are particularly long, there are four additional foot-traffic-only trails than can be run without the possibility of having to quickly dodge a cyclist bombing down a descent. Truthfully, there are better places to hike in Chattanooga. But what Stringers might lack in sweeping mountaintop vistas, enticing water features, or otherwise breathtaking scenery, it makes up for with character and kid-friendliness. Oh, and did we mention convenience? Surprising to some is the fact that Stingers Ridge actually stretches all the way from Moccasin Bend into Red Bank. The 92 acre parcel where the park itself is located is simply the only pocket of the ridge that&apos;s been protected as a Preservation Easement. But of course, it wasn&apos;t always protected, and that&apos;s part of what gives Stringers a bit of character. Along the way, hikers can witness a handful of graffiti-covered, manmade structures gradually being reclaimed by the forest, and they can let their imaginations run wild as to what these structures once might have been. For families, especially those with young ones, Stringers is a treat. The trails are smooth and far from technical, and they&apos;re also short—making it easy to tailor the experience to even the crankiest little toddler. The obvious highlight for hikers, however, is the view from the observation deck. This particularly postcard worthy ridgetop view, which can be witnessed by accessing the Cherokee Trail (a double-track path that used to be an old road traversing the ridge), is a great spot to snap a photo, hang out for a while with a book in hand, or catch a sunrise or sunset. Though Sunset Rock at Lookout Mountain might offer a higher vantage point, the view from Stringers easily offers a better view of the actual downtown district, and it provides a nice "outside-looking-in" kind of experience, where you can see cars driving over the bridges, but you can barely hear their motors&apos; roar. 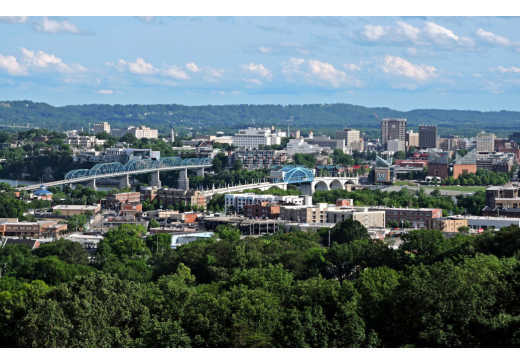 Once you&apos;re done exploring, you&apos;re not far from the many local eateries sprinkled along Chattanooga&apos;s Northshore, making it easy to reward yourself with whatever caloric sustenance your stomach desires. So next time you&apos;re looking for an adventure in the Chattanooga area, just know that you don&apos;t have to look far.